Johannesburg (South Africa) – Excitement has reached unprecedented levels as EFC AFRICA enters final preparation for its 10th event. Each of the previous nine landmark events have raised the bar for African MMA and EFC AFRICA 10 shows every indication of following this trend when the action begins this week at Carnival City. Weigh-in for EFC AFRICA 10 takes place on Wednesday 31 August and offers a mouth-watering starter for Thursday’s main course. Weigh-in is generally the first and only time that EFC AFRICA athletes see each other before their bouts and emotions always come to the fore, occasionally through heartfelt messages of encouragement or, more frequently, volatile stare-downs. Weigh-in takes place at the Mardi Gras Theatre, Carnival City, Johannesburg from 2pm and is open to the public. Free drinks and snacks will be served. When fight night arrives on 1 September, the Big Top Arena’s doors will be flung wide at 5pm to receive throngs of fight-hungry fans eager to take their seats before the first fight kicks off at 6pm. From 7.30pm the live broadcast to Nu Metro cinemas will begin, allowing packed cinemas across the country to share the incredible atmosphere generated by a live EFC AFRICA event. Tickets are still available for the live event and at the following Nu Metro cinemas: Pavilion, Canal Walk, Menlyn Park, V&A Waterfront, Grand West, Galleria, Hatfield, Riverside, Loch Logan, North Park Mall, Klerksdorp, Walmer Park, Boardwalk and Worcester. Two champions will be crowned and a number of Africa’s elite warriors will do battle across 12 bouts inside the EFC AFRICA hexagon. For the evening’s main events, Dallas Jakobi will challenge current EFC AFRICA welterweight champion Adam ‘The Prodigy’ Speechly for his title, and in EFC AFRICA’s lightest weight class top contenders ‘King’ Leo Gloss and Demarte ‘The Wolf’ Pena will battle it out for the EFC AFRICA featherweight title. Expect hours of electrifying MMA at Africa’s most exciting combat sports event! 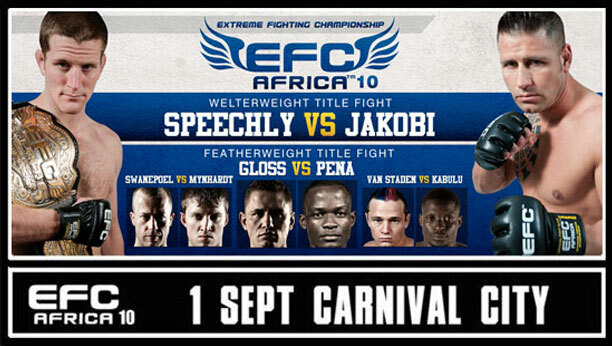 EFC AFRICA 10 takes place at the Carnival City Big Top Arena on 1 September. Tickets for the live event are on sale now at Computicket www.computicket.com and tickets for the live broadcast to Nu Metro Cinemas are on sale at www.numetro.co.za.